More than 70 percent of the surface of the Earth is covered by water: oceans, seas, rivers, and lakes. Sometimes humankind just can't get enough dry land to set foot on, so we create artificial islands for our needs. Here are nearly 40 examples of this effort, from an ancient crannog to a modern rocket-launching platform. A crannog. A small, circular, partially, or entirely artificial island, usually built in Scotland and Ireland. Crannogs were used as dwellings over five millennia, from the European Neolithic Period to the early 18th century. Durrat Al Bahrain, Bahrain, photographed from the International Space Station. Set at the southern end of Bahrain Island, it is a complex of 14 artificial islands designed for residential living and tourism with luxury hotels and shopping malls. Amwaj Islands, a group of man-made islands located in the northeast of Bahrain, near the coast of Muharraq Island, reclaimed from the relatively shallow seas. Covering roughly 2,790,000 square meters, the islands contain residential, commercial (high-rise), hotel, and retail buildings. Île Notre-Dame is located in the Saint Lawrence River in Montreal, and was created for Expo 67 to celebrate Canada's centennial. It was built in 10 months from 15 million tons of rock excavated for the Montreal Metro in 1965. Ontario Place, located on the shore of Lake Ontario, Toronto. The site includes the Molson Canadian Amphitheatre, event facility "Atlantis," and a geodesic dome, among others. It was opened in 1971 and consists of three artificially constructed islands. Hong Kong International Airport, the main airport in Hong Kong, is located on the artificial island of Chek Lap Kok. The airport opened in 1998, and is currently the world's busiest cargo gateway and one of the world's busiest passenger airports. The Hong Kong Convention and Exhibition Center, built on an artificial island, constructed from 1994 to 1997. The project took only 48 months from reclamation to completion. Macau International Airport, situated at the eastern end of Taipa Island, opened in 1995. The Donauinsel (Danube Island) is a 21.1 km long, but only 70-210 metres wide island in central Vienna, Austria, between the Danube River and the parallel excavated channel Neue Donau ("New Danube"). Peberholm ("Pepper Islet") was created as part of the Øresund Bridge connecting Denmark with Sweden. Trekroner Søfort (literally Three Crowns Sea Fortress) is one of the three sea forts built on artificial islands, that the Danes created to defend Copenhagen's harbor. Île aux Cygnes (Isle of the Swans) is a small artificial island in the Seine in Paris, France, constructed in 1827 to protect the port of Grenelle. MOSE (MOdulo Sperimentale Elettromeccanico, Experimental Electromechanical Module) is a mobile gate project intended to protect the city of Venice, Italy, and the Venetian Lagoon from flooding. IJburg is a huge residential neighbourhood under construction in the east of Amsterdam, built on artificial islands. Neeltje Jans is an artificial island in the Netherlands, halfway between Noord-Beveland and Schouwen-Duiveland in the Oosterschelde. It was constructed to facilitate the construction of the Oosterscheldedam (Eastern Scheldt storm surge barrier). Whale Island is a small man made island in Portsmouth Harbour, close by Portsea Island, Hampshire, England. It is home to HMS Excellent, the oldest shore training establishment within the Royal Navy, and the location of the Navy Command Headquarters. The Principality of Sealand. This recognized micronation is located on HM Fort Roughs, a former World War II sea fort in the North Sea, 13 kilometers off the coast of Suffolk, England. The Chūbu Centrair International Airport is the second airport built in Japan on an artificial island. Dejima was a small fan-shaped artificial island built in the bay of Nagasaki in 1634 by local merchants, later integrated into the city. Tokyo Disneyland is a 465,000 square-meter theme park in Urayasu, Chiba, Japan, near Tokyo, built on an artificial island. Thilafushi is an artificial garbage dump island, located between Kaafu Atoll's Giraavaru and Gulhifalhu of the Maldives. Gospa od Škrpjela (Our Lady of the Rocks) is an artificial islet off the coast of Perast in Bay of Kotor, Montenegro, created by sinking ships loaded with rocks in the 15th century. The Uros built more than forty floating islands of reeds, in Lake Titicaca, located between Peru and Bolivia. The Pearl-Qatar (TPQ) in Doha, Qatar, is an artificial residential island spanning nearly 4,000,000 m2. An S in the Kamfers Dam lake, north of Kimberley, South Africa. A major breeding site for Lesser Flamingos since construction of the artificial island. Burj Al Arab, a 7-star luxury hotel in Dubai, United Arab Emirates, stands on an artificial island. The Palm Islands are two artificial islands in Dubai, in the shape of a palm tree, topped with a crescent, with a large number of residential, leisure, and entertainment centres and 520 kilometers of non-public beaches on them. The World or World Islands, Dubai (on the right). This artificial archipelago of various small islands was composed mainly of sand dredged from Dubai's shallow coastal waters. Balboa Island, Newport Beach, California, is comprised of three modified or artificial islands in Newport Harbor. Balboa Island is one of the densest communities in Orange County: 3,000 residents live on just 0.52 square kilometers, which is a higher population density than San Francisco. Freeman Island, one of the four artificial THUMS islands in San Pedro Bay off the coast of Long Beach, is used for oil drilling in Long Beech, California. They were built by a consortium named after the parent companies—Texaco, Humble Oil, Union Oil, Mobil Oil, and Shell Oil—in 1965 to tap into the East Wilmington Oil Field. Treasure Island, San Francisco Bay. Built in 1936-7 for the 1939 Golden Gate International Exposition. Miami has more than 10 artificial islands, probably the most in the world before the "Great Dubai Artificial Island Boom." U Thant Island, a tiny artificial island located in the East River, in the borough of Manhattan in New York City, is protected as a sanctuary for migrating birds. It was created in the 1890s, when William Steinway constructed trolley tunnels under the East River to link Manhattan to Steinway Village. Swinburne Island is the smaller of two artificial islands created in the Lower New York Bay east of South Beach, Staten Island; it served as a quarantine site for immigrants arriving by ship in the 1870s. 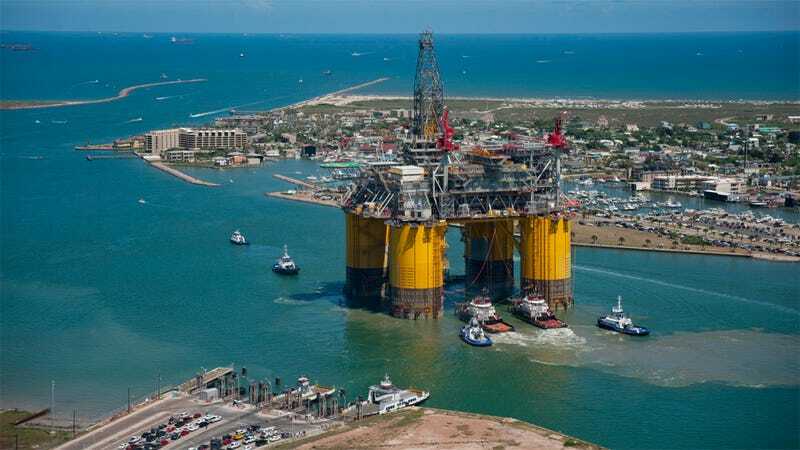 Perdido, operated by the Shell Oil Company in the Gulf of Mexico, is the deepest floating oil platform in the world at a water depth of about 2450 meters, and nearly as tall as the Eiffel Tower. Sea Launch is an international non-governmental spacecraft launch service run by four companies from Norway, Russia, Ukraine, and the United States. The Zenit 3SL rockets are positioned on top of the self-propelled platform—called the Ocean Odyssey—and then moved to the equatorial Pacific Ocean for launch.